It’s decidedly late to be joining the year-abroad-blog party – but after a month of watching friends succumb one by one to the trend, I have joined it nonetheless! I’m a little new to the business of blogging, so I should probably begin by disclaiming rights to most of the photos, as well as the funnier Berlin related quotes that I found on the internet, which feature on this blog. Most of what I say is also written in sarcasm. And thus it beginneth. My time in Berlin started about a month ago, when, after a swift conveyance from the UK to the land of beer and currywurst, I began the long and grueling journey from Schönefeld airport to Berlin city centre, weighed down by a case full of clothes and other things my mum told me to pack (a 23km quest). Had Von Suppe been aware of this arduous challenge in 1800, he would certainly have thought twice before so blithely encouraging children to go to Berlin. I spent my first night in a hostel before moving to temporary accommodation in Lichterfelde – an area comparable to Schönefeld in terms of remoteness and popularity. I soon found out that searching for a WG (a flatshare) in Berlin as a foreigner is the hardest and most soul-crushingly stressful thing in the world. Despite sending about 300 emails over the course of 3 months, I had only managed to arrange 3 or 4 viewings, all of which turned into awkward interviews when I found out I was being considered against 20 or so other applicants. And lie though I did that I was a 25 year old vegan who regularly bought bag loads of bio coffee to share with his flatmates, I was successful in none of my attempts. Modern critics have interpreted various works by Kafka to be reponses to the administrative struggle of studying in Berlin. 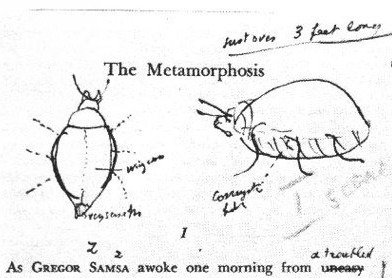 Most students can relate to Gregor’s state of confused helplessness in the Metamorphosis. The root problem is that many landlords require various meaningless documents such as Schufa ID and Einkommennachweis, and these documents require a German bank account, which in turn requires a German address registered at the Burgeramt – a Berlin-wide administrative body whose purpose no one really understands, and whose waiting lists now extend well into December. With homelessness looming, I was lucky to find a flat just before the process of matriculation at my university began. And I mean lucky – all my friends here agree that the only way to find a room in Berlin is through a stroke of luck; which for some unfortunate students never comes. Even this morning I saw people desperately spamming flat-hunting groups on facebook, hoping in vain to find a place to move into as early as tomorrow; victims of Berlin’s unforgiving selectivity. 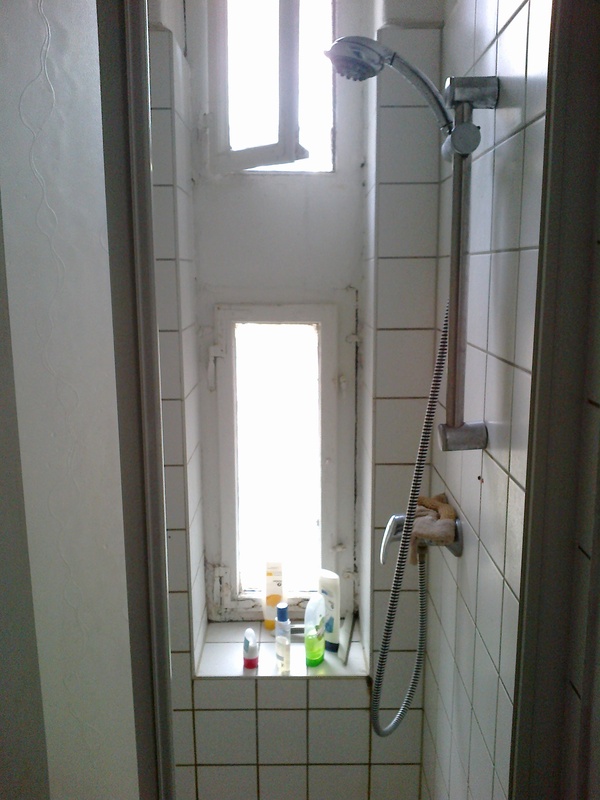 So at the expense of stress-induced weight and hair loss, and a €700 deposit, I gained worldliness, pessimism, and a 4th floor apartment room in Wedding (Berlin’s poorest district). Then began the matriculation process at Humboldt university: the administrative correlative of scaling the Fernsehturm with hands and feet bound. The only saving grace was that I am from an EU country. For non EU students, matriculating at Humboldt is similarly like facing the climb up the Fernsehturm, only first having one’s throat slit by paperwork for a visa, then being made to pay for health insurance to cover the medical costs. With all this stress during the day, I was glad for the opportunity to explore Berlin’s world famous clubbing scene at night. The first nightclub I visited was Tresor, and, though I was expecting a sightly stricter entrance policy and a slightly later end to the night than in the UK, I was not expecting a totally disparate experience. A lot more people were turned away than I expected, and once inside we had to navigate a network of tunnels (the site is a converted power station) in order to enter a crowded, dark room suffused with smoke of various flavours (Berlin takes a permissive attitude to indoor smoking and ‘kiffen’). A host of drug-fueled clubgoers clad casually in monochrome danced mindlessly to a throbbing techno beat, which is the music of choice for Berlin’s trendiest clubs – song lyrics are a thing unheard of here. We left, exhausted, by 6am; an early finish by local standards. 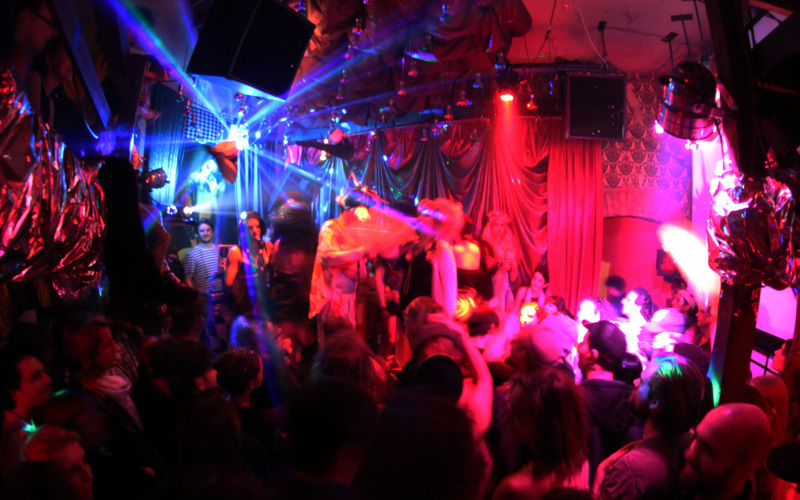 More recently I sampled the delights of Salon zur Wilden Renate, a circus themed club in the east of Berlin. 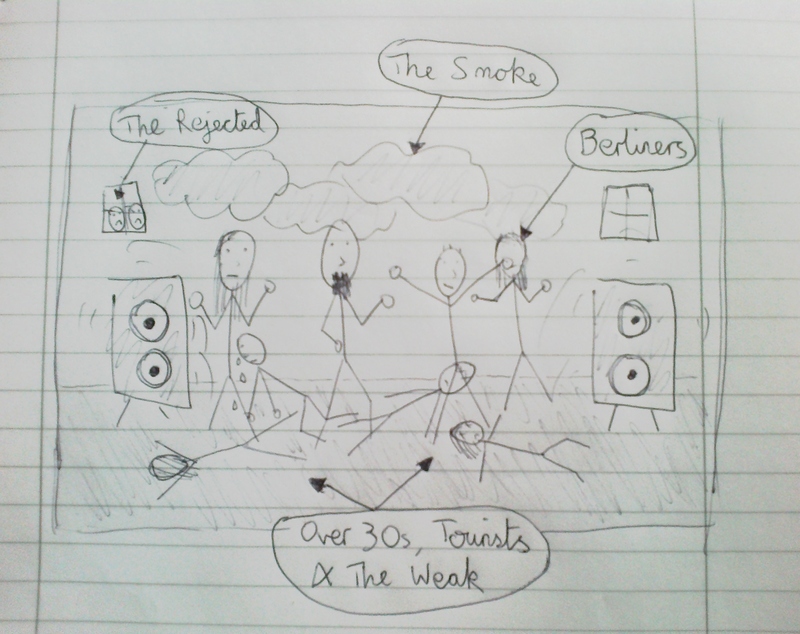 Following an even later finish, I returned – saturated with smoke and sweat, and shaken by the realisation that this would be the norm for nights out – to my Wedding accommodation, defying the looks of disdain given to me by early-rising workers. As I lumbered into the bathroom it occurred to me for the first time that, with the lights on, anything in the shower (next to a sizeable window) would be illuminated for any unsuspecting onlookers below. But I was desperate to be cleansed, and did not trust my drunken self to select the right water temperature in the dim morning light, so I pressed on regardless. And though anyone walking past below would have seen my naked form, they would not have seen any fucks because none were given that morning. I’m conscious that my word count is racking up now, so this seems like an appropriate place to draw my first post to a close. I should end on a more serious note by thanking all the really cool people who I’ve met here so far, and pressing my thumbs (no one crosses their fingers in Germany) for more fun times and fewer naked shower displays. Bis dann!